But in law enforcement, time is of the essence. They need to get a handle on all of this data—and fast. They need to respond in the moment. The real-time data coming into their system needs to be understood and acted upon in real time. With real-time spatial analysis, organizations like this police department can determine the most effective response to an incident as it is happening. Spatial analysis can be used to quickly compute optimal paths along linear networks and take into account the asset’s capabilities, distance to the incident, traffic, and road conditions. Operation center managers and dispatchers can use maps to make sense of what’s going on and determine the best course of action. Now let’s take a look at a real-world example. The Chicago Police Department is rolling out their new command and control center. A key feature is the live digital maps dominate the wall of large monitors facing everyone in the room. If you’ve ever been inside a command and control center or a dispatch center, you know that it can get hectic. Getting the right information to the right people at the right time can sometimes become a matter of life and death. 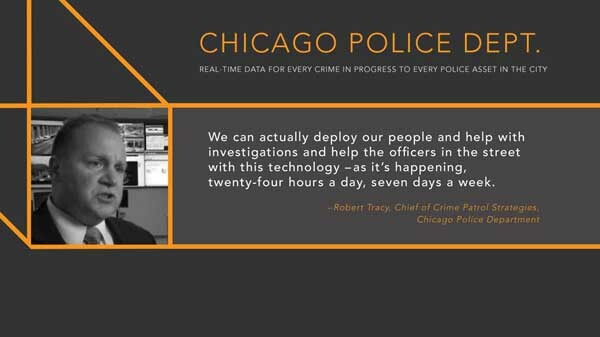 Before this new system was in place in Chicago, officers might have had to wait an hour to get the right information. Now they can get it immediately. 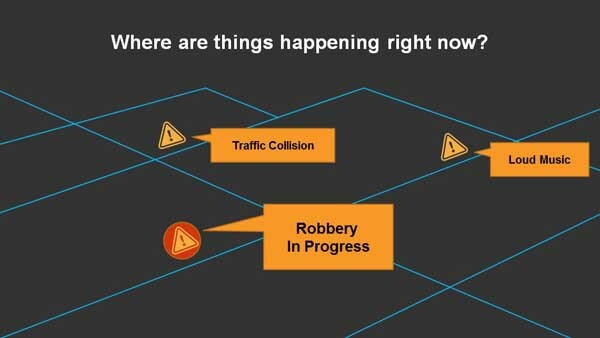 This system provides a real-time look at every crime and incident in progress as well as the exact location of every police asset. Officers can also use the system to take control of any of the ~25,000 cameras available citywide. It’s designed to put the right information in the hands of police, where they need it and when they need it. This idea that people gather around maps and use the common language of spatial analysis to make better decisions is played out every day, and the Chicago Police Department is a great example. Now let’s look at a similar use case where mapping brought everyone in the room and everyone in the field together while dynamic, raw real-time data was brought into focus and made actionable. Earlier this year, the Napa Valley in northern California was hit by a large earthquake. The 6.0 magnitude quake caused damage to buildings and numerous water leaks in the city of Napa. 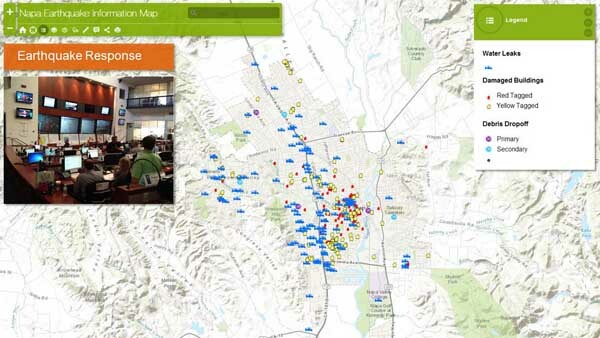 In response to this natural disaster, the City of Napa posted the Napa Earthquake Information Map, making it public so that everyone—emergency response organizations as well as every citizen—could see where the water leaks and damaged buildings were, and how the city was working to address these problems. As information was updated in the field, it was immediately updated on the live web map. This information was shared with the California Office of Emergency Services, who used the map to work closely with the City of Napa to coordinate response and solve issues in real time. These two case studies illustrate how mapping and spatial analysis help organizations deal with large quantities of fast-moving data every day. Maps just make sense to people and spatial analysis is not really a difficult language to learn. In these cases, and many more like them, everyone in the organization is benefiting from the use of location data. The person in the field, the analyst, the manager, the executive…they are all able to get on the same page and work together when they use maps. When you get people at every level of the organization using maps and mapping tools, especially in a critical situation involving real-time information and analysis a social connection forms and everyone starts talking the same language—the language of spatial analysis.